Trails south of Road 3350 (Powerline Road) are closed March 15 - May 15 for Sage Grouse habitat. Find out more here. 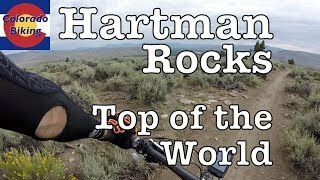 This big loop is a tour of the entire Hartman Rocks trail system. Start pedaling up Tugs and then stay left on Jack's Trail for a nice warm-up. At the top of the hill, turn left on the road and then right on Road 3505b to access Tailpipe. Tailpipe is a quick, fun, intermediate trail that descends a ridge with great views. The lower end of the route crosses Road 3515 and then connects again at the intersection with The Ridge. Turn left on the road and follow it down to Top of the World. Top of the World is formidable climb with some steep slickrock sections. The latter half of the trail is slightly downhill, connecting with Road 3545a. Stay left here and ride to a busy intersection. Stay left again to Road 3545 to Gateway. Bear left on Gateway. The trail has short sections where the terrain gets interesting in both the climbs and downhill. Despite the up and down it doesn't lose much elevation over the course of the trail. At the junction with Josie's, turn right. There are a few tricky uphill moves, but the majority of the trail is fairly fast and swooping on the downhill. Cross a road and then pedal through Buddy Bear, a fairly easy beginner trail. Turn right on Dirty Sock, a trail with sections of mixed, harder technical moves. At the end, turn right, followed by a quick left onto Dave Moe's. Try to keep your momentum going as the first part of this trail is a short, pumping climb out of the gully. Catch your breath at the top and enjoy the rest of the trail as it winds up and down. A few short, technical spots will keep you on your toes. Bear left on Road 3555 for a short section and then continue on Enchanted Forest. The trail drops elevation and winds through a nice, shaded wash. After a half mile, you'll come to a 3-way intersection. Go through the cattle fence (it may just be open, but read the sign. You might need to close the gate behind you). Stay right along the fence-line on the singletrack. Continue straight on the singletrack until you get to Road 3550 (Powerline Road). Turn left and cruise down to Skull Pass. Don't let the name of this trail intimidate you, as it's fairly mild and worth the effort. There are a few short, harder, technical sections making this trail rated a black diamond, but other than that the rest of the trail is tons of fun with some tight, fast turns through the trees. Take a right and head up the hill on Road 3550 (Powerline Road) to Outback, a fun trail that includes a mix of singletrack and slickrock with some interesting moves and sections. At the end, turn right on Road 3575 and then another right on Nine-0. Start this section of the ride with a quick, fairly steep, uphill followed by a fast downhill that contains some loose rock. Bear left on Road 3580 and head left again on Road 3575 and then jump off onto Back In. This is a nice intermediate trail to connect back to Road 3550 (Powerline Road) to access Bambi's. Descend through a scenic drainage to the Bambi's parking area. Go out to the road and turn left for a short pedal to the start of Road 3550 (Powerline Road). Suffer through a very steep climb and then roll out to Sky Line. There are a few harder, rockier sections to navigate near the upper parts of the trail, but, otherwise, it's just a solid intermediate route. Connect with Broken Shovel and enjoy a gentle, sloping, downhill section. Cross Road 3570 to access Josho's, one of those trails at Hartman Rocks that shouldn't be missed. Enjoy another descent and then climb up steeply through a beautiful drainage. 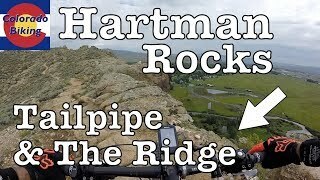 From there, you can go right to Rattlesnake, another highlight at Hartman Rocks. This trail throws a lot at the rider in a short amount of time. Be ready for a continuous mix of fast singletrack, punctuated by slickrock and various technical rock features. Turn right at the end and roll out on Road 3535 to the top of Beck's. Descend this short route, crossing Road 3525 to The Notch. Ride up the doubletrack and begin a short, fun ascent on tricky slickrock. Find the natural line through the rock and you'll come to a "notch" through the ridge. After riding across the ridge, you'll begin a fun, steep, technical descent back to the bottom of Jack's Trail. Finish the route by turning left and descending back to the parking area on Tugs. Railing berms on Collarbone Alley trail. Extended look at the Top of the World trail.